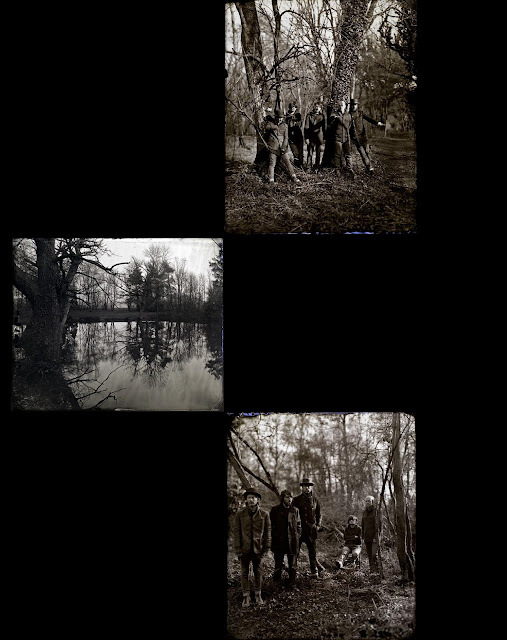 Documentary images set to the song 'Grown Ocean' from the album Helplessness Blues, which is out May 3rd, 2011 via Sup Pop Records. This is definitely going to be one of the big time Indie releases of 2011. 'Grown Ocean' sounds great, as did the first listen of the title track, we could very well be in for something special here. Could each eye represent a song? 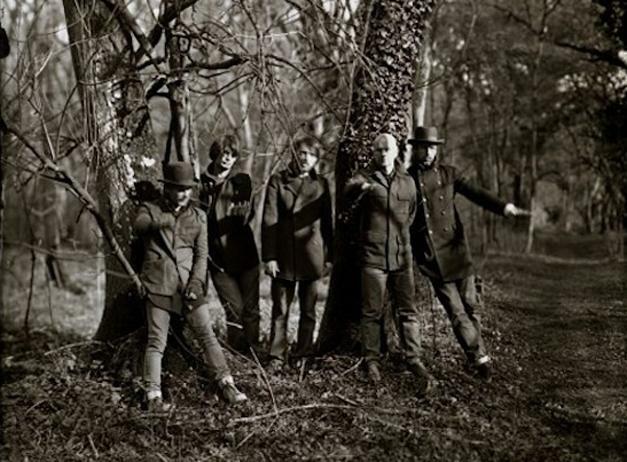 So now I am wondering with these 2 new songs, will there really be any more additions to The King of Limbs? On Radiohead's site with the Newspaper album order it says “One lucky owner of the digital version of The King Of Limbs, purchased from this website, will receive a signed 2 track 12″ vinyl. Competition closing date 28th March." This could very likely be the 2 songs they were talking about. The artwork really goes with 'These Are My Twisted Words' and 'The King of Limbs'. Maybe instead of all this The King of Limbs Part 2 talk it really is just a piece by piece type of album. Everyone complained about the 8 song album and that if felt incomplete. Maybe this is Radiohead's way of having this revolutionary "The First Ever Newspaper Album". Just like the whole maze/goose chase so far with The King of Limbs nothing has been made clear with the band and everything really has just seemed like a puzzle. The Newspaper album could just be that - "A PUZZLE" - one that the band just releases in pieces and you have to put it all together in the end. It is kind of fun to get a new song or a couple of new songs here and there, it keeps you interested and you can drag out the releases and keep every one's attention. There clearly is more to this Newspaper Album, with the band still not talking about it, and them not denying any of the rumours. Maybe we will get 2 new songs a month for a year! That would be like having 12 Christmases for me, I would love it. I am sure there would be others who would rather have it all in one shot, with a double album or whatever but after a month or so the excitement dies down. Releasing new material throughout the entire year would only add to the excitement of fans, the band and the whole music industry in general. Think about it there is so much new music available now through the Internet and it is almost impossible to listen to everything. Once you do listen to an album for say a few weeks or so you are on to your next new album and artist to check out. 22 still not in 'Bloom' = 11 months of 2 songs? ﻿ Releasing an album throughout a year you would keep going back to the original and adding the additional songs to the collection. The music would not get stale or old, it would be something you would want to go back to constantly. I know we have had the "Moon Theory" and "The Season Theory" already but I am just throwing out "The Puzzle Pieces Theory"
It would almost be this whole divided woods idea, that you divide "the songs" aka "The Woods" into different sections, which also goes along with the Newspaper Idea. The Season theory was an interesting one as well and is somewhat simalar to this idea. 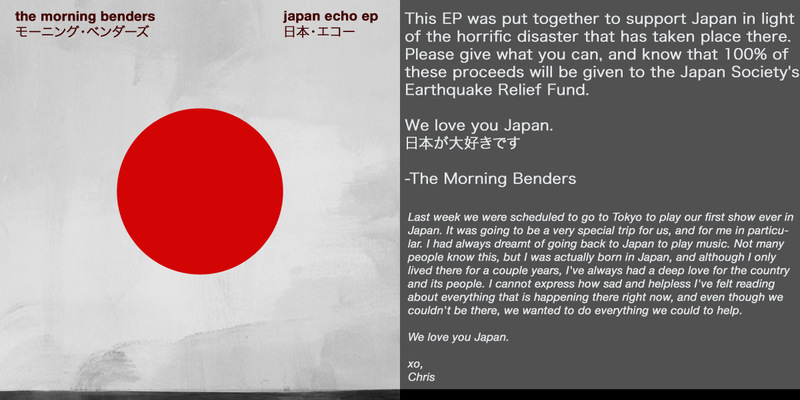 The Newspaper Album will be shipped from Monday 9th May 2011 you can, however, enjoy the download now. 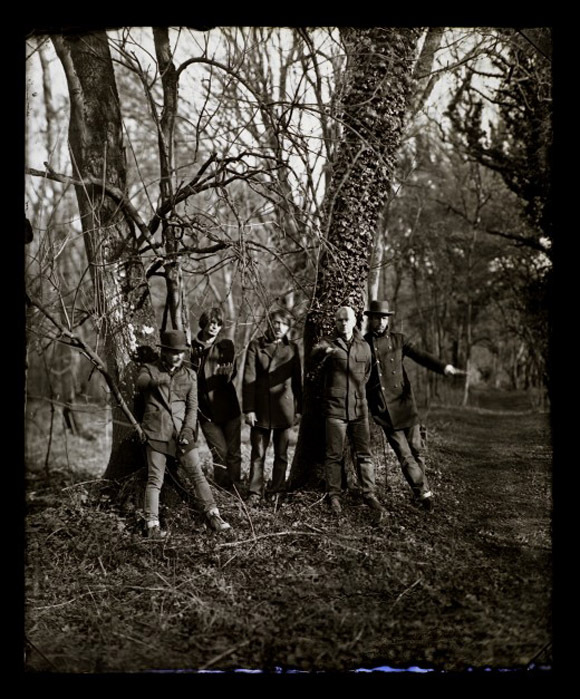 One lucky owner of the digital version of The King Of Limbs, purchased from this website, will receive a signed 2 track 12" vinyl. Competition closing date 28th March. Constant Theme of Limbs and Branches = More??? 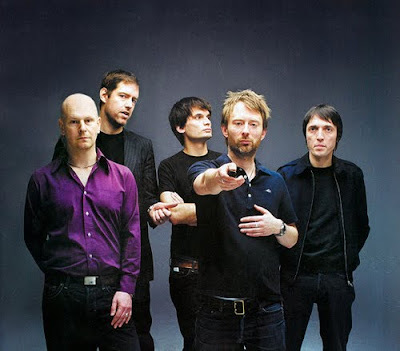 I even wrote a post about this topic back on March 19th Titled... Radiohead - the world's first* Newspaper Album talking about how clear it was that the two were separate from each other. I believe we have all missed the point in all the Radiohead "The King of Limbs" Theories. I think it was right in front of us from day one. That this is a "Newspaper Album" and how do you usually get a Newspaper, well lots of ways go to the store, go to the street (just like The Universal Sigh), or you can Subscribe to it and it automatically gets delivered to you. I think that is where we are at, when we went and purchased The World's First Newspaper Album we actually bought a subscription to it for $48 (or $53). I believe with the Newspaper Subscription we will be having several "NEWSPAPERS" delivered to us in the form of new songs, artwork, actual newspaper, or whatever Radiohead feels fit to bring us in the world of Radiohead News. With the announcement of Supercollider and The Butcher that is 2 new songs coming our way. I believe those two songs will be available to those that purchased the $48 Newspaper. I would go as far as maybe saying that every month (or couple of months) we will be getting new Radiohead material. Wasn't odd that you spent $48 for 8 songs? That is the burning question everyone has asked themselves in this whole ordeal. Well would it not make sense if that $48 was for a whole subscription of The King of Limbs plus additional Radiohead material? ﻿ The next question would be why not tell everyone up front about how this will be released? Yeah that is a good question. I would say look at the marketing and advertising of this album. Radiohead are our day Beatles if anyone can shake up the music industry surely they can, and this is an unbelievable approach at doing it. It is all over the Internet all these conspiracy theories on what this Tweet means, or what this Piece of Art represents. Everything is looked at under a microscope and people are searching for answers. Look at thekingoflimbspart2 website - people are flocking to that wanting more Radiohead details. 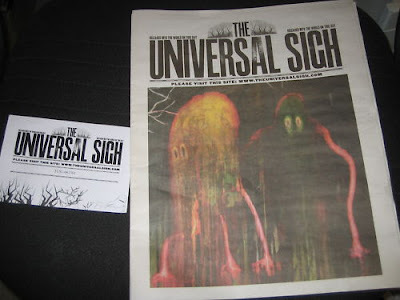 There are also rumblings about The Universal Sigh Newspaper (Not the same as the $48 version) and how it has a code with it. What is this code for? Well no one really knows the answer to that question either. Some said it was just to access your picture online, other are starting to say it is a code to get some kind of a discount on the actually $48 Newspaper (Subscription). You think someone would have tried to ask Thom these questions when he was handing out newspapers in London. Maybe Separator is actually not so much a Separator of albums but more of a Separator of Record/Album. “If you think this is over, Then you’re wrong”. The King of Limbs could have merely been the Table of Contents or the front page of this Newspaper Album. There is going to be more sections of this Newspaper, and for those of us that shelled out the $48 up front for 8 songs we will surely be rewarded. So do I have any evidence for all this mumble jumble - Nope, but it makes sense. All the clues have been there I think they might have just slightly been twisted or a little bit off. ‘The Butcher’ and ‘Supercollider’ are both set to release on April 16, Record Store Day (Over Seas that is). The 12″ will be available and it is rumoured to only be 2000 copies available. 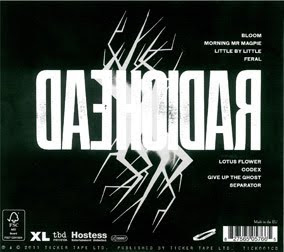 I am sure that Radiohead will also release this as a download (possibly free) as they have done in the past with 'These Are My Twisted Words'. The Butcher is the song that really gets me curious, it is a completely new song that has not been played live at any shows and no one really knows anything about it other then its title. But it could also just be a re-titled song such as how 'Mouse,Dog,Bird' became 'Separator'. Anything that Radiohead have done over the past couple of months is a mystery to anyone so who really knows. We have all heard Supercollider already from the YouTube links and all the other raw footage live, but we have not heard a clean cut studio version just yet and that is what I am excited about. Thom is brilliant performing this song live on the piano, such a great tune. It will be interesting to see the whole band together perform this and see how it all connects. 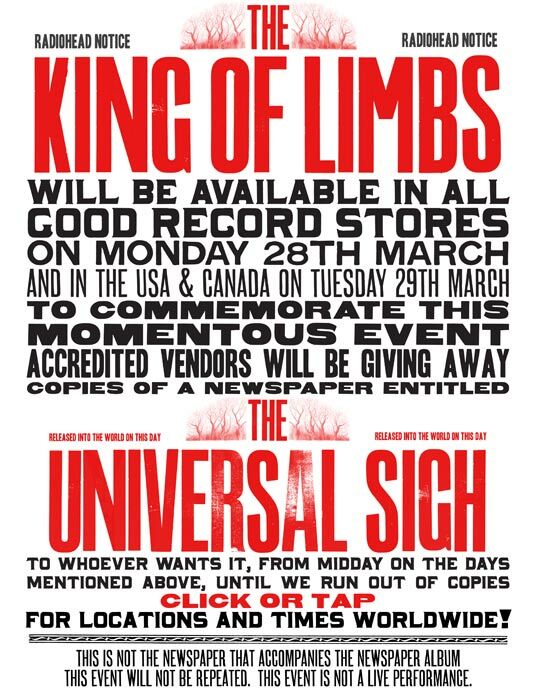 On Radiohead's site with the Newspaper album order it says “One lucky owner of the digital version of The King Of Limbs, purchased from this website, will receive a signed 2 track 12″ vinyl. Competition closing date 28th March." This could very likely be the 2 songs they were talking about. 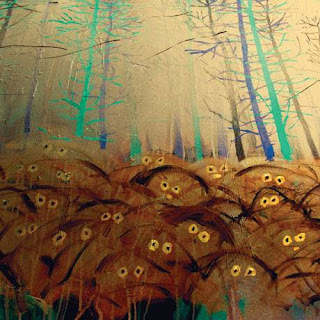 The artwork really goes with 'These Are My Twisted Words' and 'The King of Limbs'. I put the shadows back into the boxes. 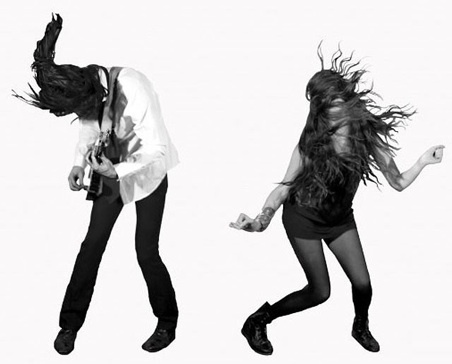 So many reasons why I am thankful that I was born in Canada, and Arcade Fire are one of them. Awesome performance by the band last night at The Junos. 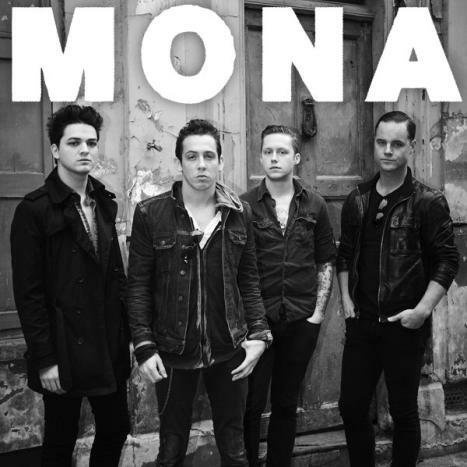 This makes me very excited to see these guys on April 11th here in Utah. They have to be one of the best live bands in the world today, just incredible with this performance last night. They ruled the awards show last night picking up Album of the Year and Alternative Album of the Year for The Suburbs, Group of the Year, and Songwriter of the Year. So the day is here for this much talked about Radiohead Newspaper (Not the same one that you had to pre-order). The Universal Sigh is now everywhere you look online. 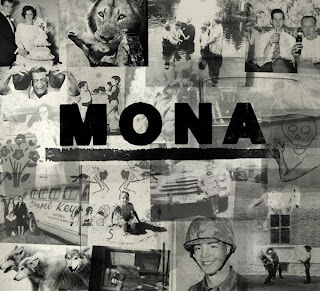 To get a physical copy of this you had to live in one of the 61 major city locations that were picked by the band. Well living in SLC, UT I was not so lucky and I am sure a lot of others are in the same situation. The Newspaper doesn't actually hit USA and Canada until tomorrow but still not really possible for me to go and pick up a physical copy of the Newspaper. If you need a copy of the newspaper right now and can't make it to any of the major city locations, our friends over at One Thirty BPM have it all over there. You can read it on their site or download it PDF style. 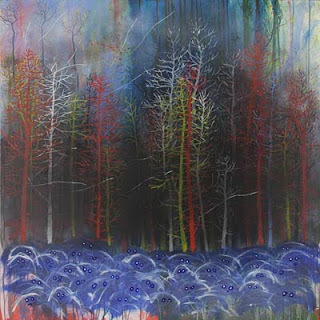 The Universal Sigh is a 13-page paper, featuring articles by Robert Macfarlane called 'Tree Climbing', another article titled 'Sell Your House' by Stanley Donwood, and one by Jay Griffiths 'Forests Of The Mind' along with several artwork pieces and lots of different lyrics, scribblings and ideas about some of the songs on The King of Limbs. If you think this song won't be released with in the near future with all this Radiohead commotion, you would have to be silly. 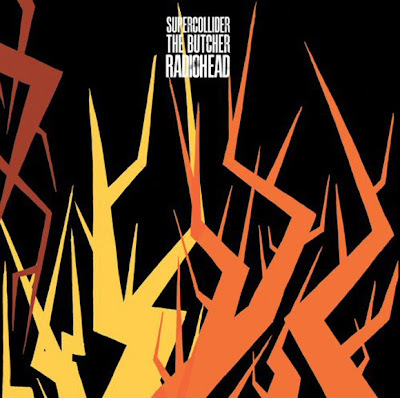 Radiohead are set to release a 12" with songs 'Supercollider' and 'The Butcher' for the upcoming Record Store Day. It is believed that there will only be 2000 copies of the 12" so if you want a copy.... well Good Luck! I am pretty excited for this news and was really hoping to have Supercollider released as a studio version and now my wish is granted. I was hoping for more then 2 new Radiohead songs as follow ups to The King of Limbs but I still believe there will be additional songs to come. The Butcher is a new song all together and hasn't been played live or heard anywhere quite yet. Should be exciting to hear another new song and to hear Supercollider as a full studio version. This announcement comes on the same day that The Universal Sigh - Radiohead's own version of a Newspaper is released. 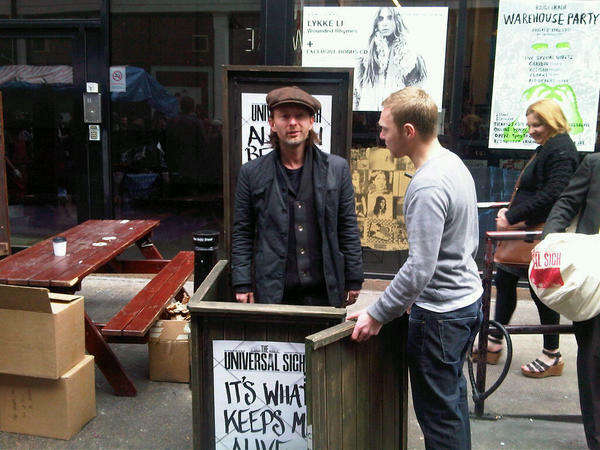 If only we were all in London to get a copy of the newspaper from Thom Yorke himself. Here is a live version of Supercollider. I am loving the keyboard playing here by Baths (or Will Wiesenfeld) on 'All My Friends'. A.V. Undercover is a series of 25 tracks covered by 25 different bands. Pretty cool cover song here and one of my favourite covers that I have heard lately. Here is the new single from Gomez titled 'Options' it was just posted on their website. Very excited about this album and just wanted to share the artwork, tracklist, and video for Listen To Your Love. Glasvegas new album EUPHORIC /// HEARTBREAK \\\ out digitally on Columbia April 5. RCRD LBL have the lead single 'The World Is Yours' available as a free download. 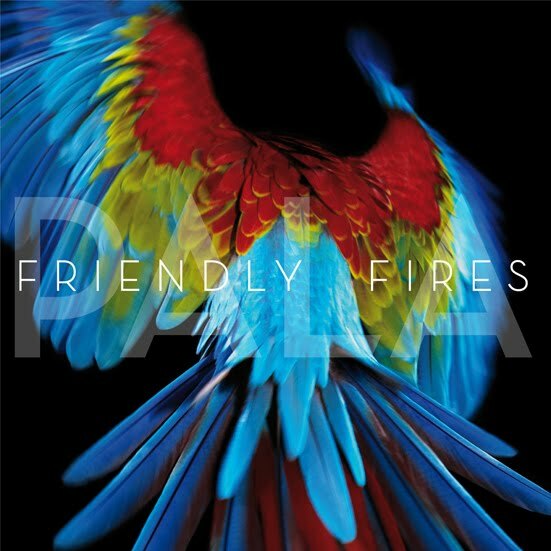 This is by far one of my most anticipated albums of 2011. Their debut album blew me away and is one of my all time favourite albums so I am hoping again for something special on the new sophomore album. Very nice song and a nice video to go with it. Kinda makes you reflect on your life I suppose. So just when we thought The Streets and Mike Skinner were a dying breed, we will already be getting some new sounds. 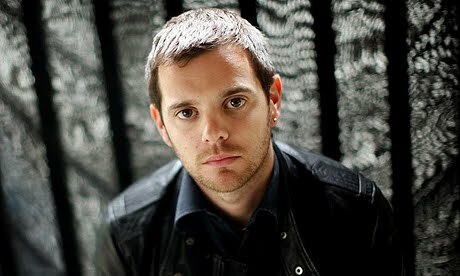 Earlier this year he said that after the band's current tour that he would be quitting The Streets. Little video of Life after The Streets.. The Radiohead album ‘The King of Limbs’ will be available for purchase in all good record stores everywhere on Monday 28th March, except in the United States of America and in Canada, where for reasons beyond the purview of this writer it will be available from Tuesday 29th March. On VINYL! On COMPACT DISC! As a DOWNLOAD! To commemorate this momentous occasion, Radiohead have produced a newspaper which will be given away, free, gratis, without cost to the consumer by accredited vendors from a multitude of locations WORLDWIDE! In the USA, in the Netherlands, in Belgium, Poland, Germany, Austria, in the Czech Republic, in Spain, Portugal, Sweden, Ireland, France, Italy, Slovakia, Finland, Greece, Norway, Lithuania, Estonia, Russia, Australia, Latvia, Iceland, Romania, New Zealand, the UK and a load of other places around the globe, our dedicated teams of newspaper delivery people will be handing out copies of THE UNIVERSAL SIGH to anyone who wants one, until we run out! 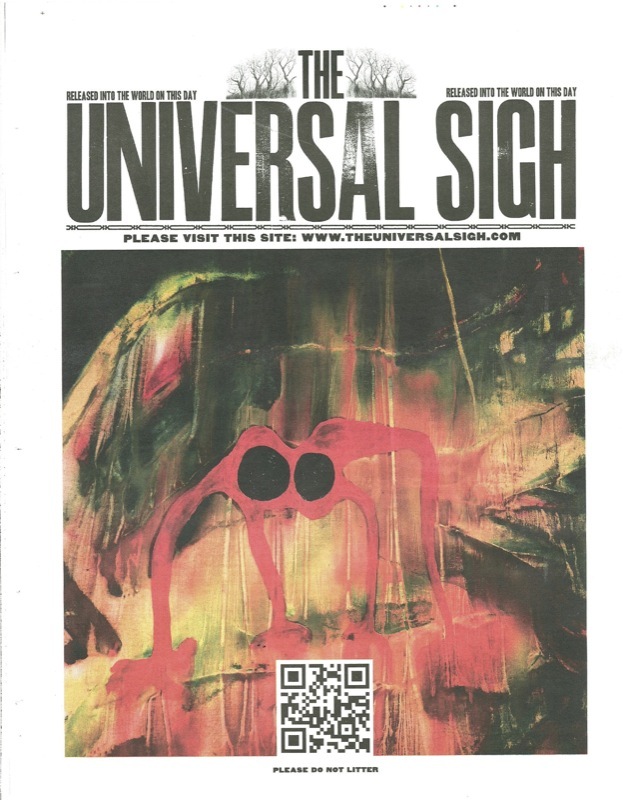 In conjunction with this unbelievable offer, Radiohead have established THE UNIVERSAL SIGH as a website on the internet, where details of your nearest vendor can be found, as well as more informations and a photogallery where we will be posting photos and the lucky owners of the gratis tabloid are invited to post pictures of themselves and their friends reading the newspaper in locations diverse and unusual. There will be other stuff too, but we haven’t thought of it yet. One of my all time favourite tracks performed by both Ashcroft and Coldplay at the same time. This is at Live8 in London. An oldie but a goodie. 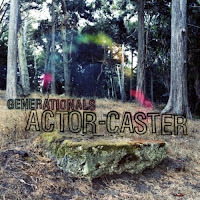 Generationals album 'Actor-Caster' comes out next week March 29th via Park The Van Records. Stream the album now below and download the song Greenleaf for free. Check out the video that goes with 'Will Do'. I just love this song, think it is absolute Gold. Sebastian Edge - Radiohead Photos - Could it be a puzzle? Look at the right side of this picture. See the whiteness or blue tone on it? It is just the same as the original picture with the band it had that same whiteness/blue tone on the bottom of the picture. I think that there is a set of pictures that all go together (8 pictures) . Actually 9 pictures because there is one right in the middle that is in color or all white/blue of some sort. It would have 3 on the top (with the original band picture the second one over), now this picture would be the fourth picture in the set on the left side of the ‘White/Blue’ middle picture. This is just a thought but that middle picture could be the center artwork for The Newspaper album and it would be surrounded by 8 other pictures. (3 on the top, one on the left, one on the right, and 3 on the bottom). It also could only be 4 other pictures leaving out the pictures in each of the corners. 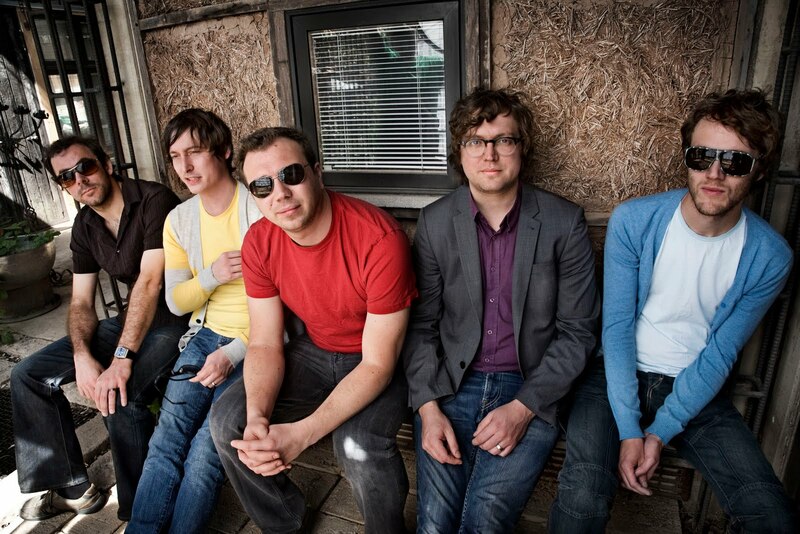 I know this is a long shot but ever since I saw that original band photo I thought there was something strange about the bottom of the picture with the light whiteness or blue tone. I think there is a whole set of these photos, and hey 8 photos could only add fuel to the fire in the 8 EP talk. Does anyone else find the whiteness odd? It is now in 2 pictures, there surely must be something to it. It really is just a puzzle that we get to put together one piece at a time. So The Strokes are back after a 4+ year disappearance. The new album is titled 'Angles' and is out as of today via RCA Records. I know a lot of Strokes fans are pretty happy to be getting a new record and some fresh material from these guys and I am one of those guys. My initial thoughts on this album are that I like it. I don't love it, I just like it. A part of me wishes I could love it like I have in the past with 'Is This It' and 'Room on Fire' but it seems more like a forced record and not one with a whole lot of passion. It is definitely better then 'First Impressions of Earth' and maybe just below 'Room On Fire'. I have took several serious listens to this album and I just can't put my finger on what is missing or what is wrong with the album. I really wanted to love this and have it as an album that would compete with my top albums of the year but it is just not happening. I felt like there were 6 really strong and good songs but the other 4 songs just weren't that great and didn't seem to fit at all. Machu Picchu is a very refreshing and hip Retro type of tune that was a great way to start off the record. 'Under Cover of Darkness' was the first single that we have all heard for the past month. 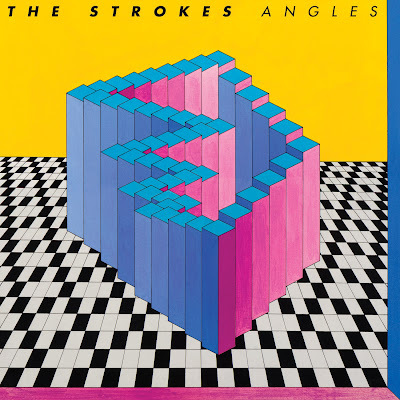 It is a great song and definitely gives hints to The Strokes greatness, being a Is This It type of song. Very catchy and upbeat and the lyrics such as "Everyone's playing the same song for ten years" sure makes you think. 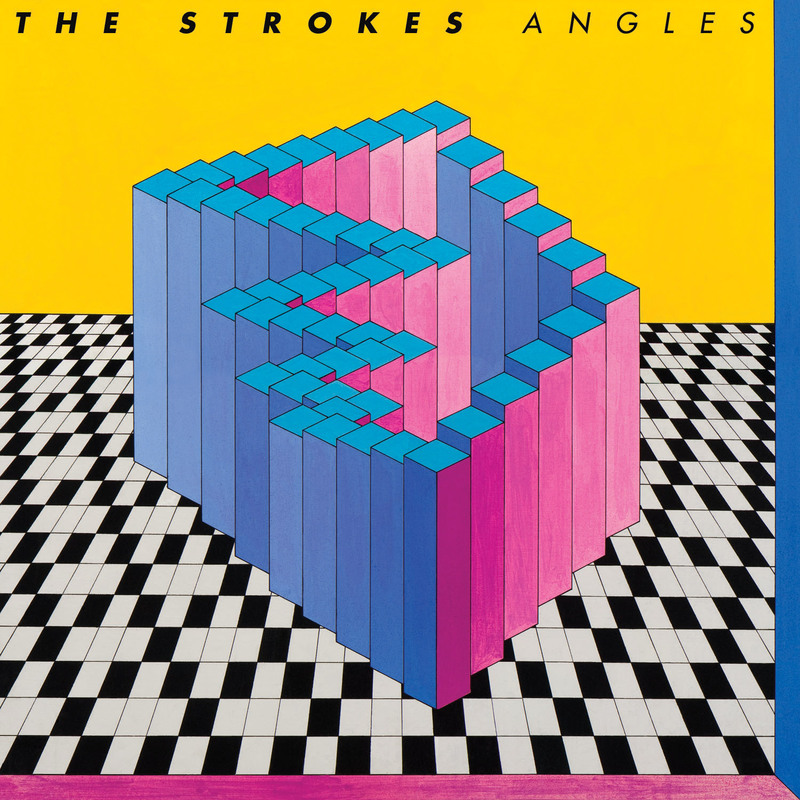 'Two Kinds of Happiness' has a great 80's vibe to it, and goes off really in a whole new territory as far as Strokes songs go. At first I was hesitant of this song and the sounds it portrayed but now I am actually really digging it and it is one of my favourites. You're So Right, just doesn't feel right. It sounds like it should be a B-side and nothing more. I guess you could call it a poor man's Take It Or Leave It but it would have to be an extremely poor man. 'Taken For A Fool' has a sweet intro with Julian showcasing his vocal talents. The song has a great flow to it and works well from start to finish. 'Games' is another one of those songs that just doesn't feel like it fits, it doesn't have the feel of a Strokes song, not sure what it is but just wasn't crazy about it. 'Call Me Back' is a very relaxed, mellow and chilled out tune, almost a depressing song that they don't care to even be playing. 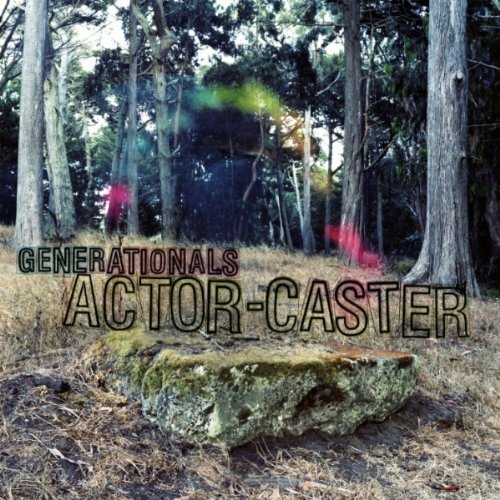 'Gratisfaction' is pretty cool, has a great upbeat familiar sound to it. Almost makes me think of The Rolling Stones a little at first listen. 'Metabolism' has some cool guitar riffs and is a little bit of a darker type of song. Love the drums in this song. The last song on the album 'Life is Simple in The Moonlight' is a highlight track for me. It was featured on SNL and I thought it was pretty good then but the more I have listened to it now the more I am feeling it. It is just a complete song that goes back to basics which brings out that classic Strokes sound. Overall Angles feels a little forced at times but also it offers some great songs and moments. It has a very Retro feel to it, and some what of a somber tone to it as well. It is almost like you can feel tension in the band through the songs and the album as a whole just doesn't mesh well. It will be interesting to see how the band does with this album and touring it, and if they can overcome their challenges and even stay together for any further Strokes work. 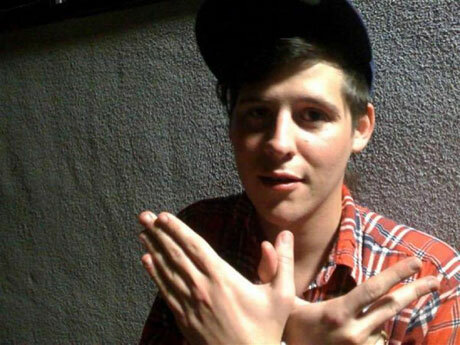 I almost feel like Angles was just a forced record and everyone just threw their own ideas together and just put it in the record anyway they knew how. It is definitely not a polished album and one that you feel the bands chemistry. If I had to rate this album I would give it a 7 out of 10. I really like the songs Under Cover of Darkness, Life is Simple In The Moonlight, Machu Picchu, Taken For A Fool, and Two Kinds of Happiness. 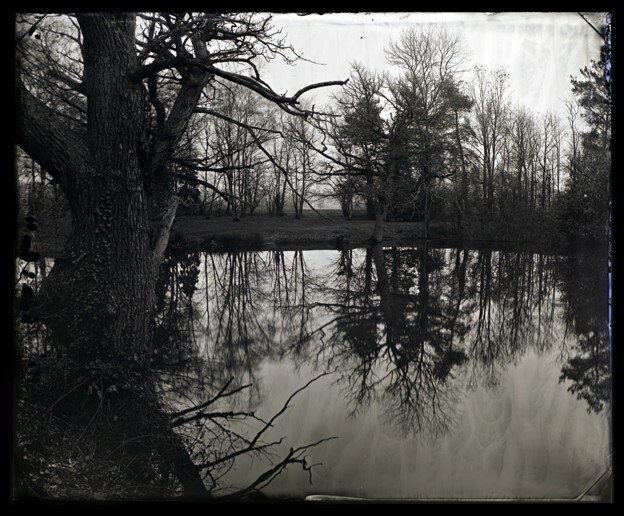 check out the guys over at www.ateaseweb.com They have a pre-released copy of The King of Limbs. The cd is housed in a 4-page wallet, with the actual cd in a slit on the right side. On the left page you can see 8 illustrations accompanied by the following titles; Roots Of Roots, Ragnorok, Urpflanze, The King Of Limbs, Codex, Axis Mundi, Yggdrasil and Arbor Philosophica. So what does all this mean? Well your guess is as good as mine, but it does make for some fun debating and speculation. What I found most interesting was the fact that 2 of the titles "The King of Limbs" and "Codex" we have both already heard before. The King of Limbs being the title of the lastest record, and Codex being a song from that record. Now with the back artwork and the split up of the 8 songs - 4 on the top and 4 on the bottom, does this mean that The King of Limbs is actually 2 seperate EP's? One being The King of Limbs and the other being Codex? 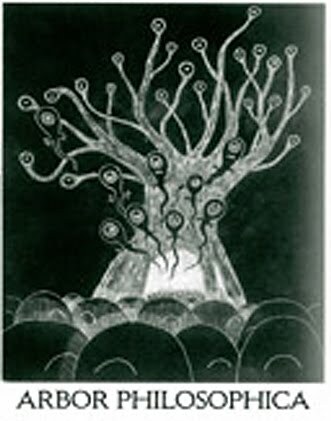 And if this is the case do we have 6 more EP's coming, with the following titles Roots Of Roots, Ragnorok, Urpflanze, Axis Mundi, Yggdrasil and Arbor Philosophica? Makes you wonder now doesn't it? 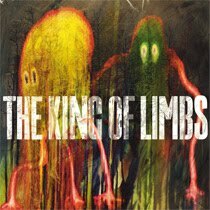 The King of Limbs is released on Tuesday, March 29th here in the USA via XL Recordings. Here is a first listen to new Matthew Good. 'In a Place of Lesser Men' is taken from the new album Lights Of Endangered Species which will be out May 31st. Lights Of Endangered Species is Matthew Good's ninth studio album and sixth with producer Warne Livesey. It was recorded October through December 2010. Ever since hearing Hometowns and the haunting sounds of 'Don't Haunt This Place' and 'Drain The Blood' I have been totally on board with RAA. Departing was an album I was drooling about before it was even released. Hearing the early tracks of 'Stamp' and 'Tornado 87' I was very impressed and couldn't wait for the full release. 'Two Lovers' is the opening song and it offers some pounding guitars mixed with a unique voice, and mellow keyboards bringing out a strong song. 'The Breakup' has a great drum intro that really sets a tone for what is to come later on. 'Under The Knife' and 'Muscle Relaxants' both offer as good poppy songs with sounds of bells chirping in. 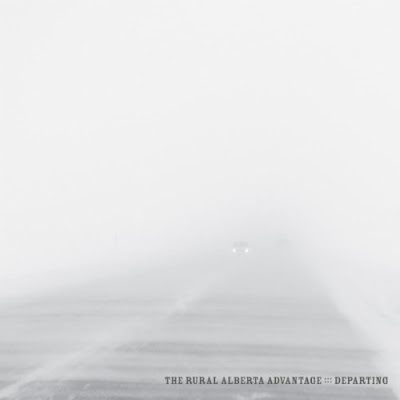 'North Star' may just be the sweetest and most sincere song from The Rural Alberta Advantage, it is really the lone complete chill out song on the album. 'Stamp' is just that a Stamper it is a fierce power jolt all in just over 3 minutes. 'Tornado 87' is a nice back to back companion for Stamp putting a lot of the meat right in the middle of the album. I would describe Tornado 87 as a fierce beautiful mess of solid awesomeness. 'Barnes Yard' and 'Coldest Days' are a little less intense and have a real poppy feel to them. Finally to close the album 'Good Night' has the perfect name and to go along with that the perfect sounds. I love how the vocals are portrayed in this song and how it starts off as a sweet little acoustic jam. Departing is a lot more poppy then Hometowns, and that was the first thing I noticed while listening. It has a little less edge to it and a little more smoother tone to it. 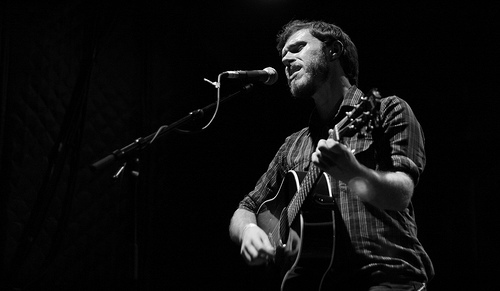 Nils Edenlogg's voice is something magical and not something you find in every other band out there today. His voice really sets this band apart and makes them the unique sound that they are. There are a lot of powerful upbeat songs on this album and they are accompanied by some soothing background vocals and sounds. It all meshes together quite well with each song being very complete and direct, it is a solid listen. Yes I have read all the reviews of how aweful this album is over in the UK and what not but Bah - who really cares what others think. For me Ashcroft has really been given a rough ride since the departure of The Verve. I really feel it is unfair and that his solo stuff has been great, some of my favourite actually. 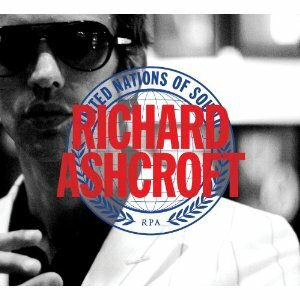 United Nations of Sound is no different the critics are scraping this album as rubbish but I say give it a shot, Ashcroft is one of my favourite lead singers out there and he has been given an incredible talent with his music abilities. United Nations of Sound will be released March 22nd via Razor & Tie Label. 7 How Deep Is Your Man? I am a big The Vaccines fan and think that they are going to be something really special. I have not been anticipating an album quite like 'What Did You Expect From The Vaccines?' for some time. Every time I hear If You Wanna I just think that it has that Johnny Cash flair to it and I think it is just an awesome tune. 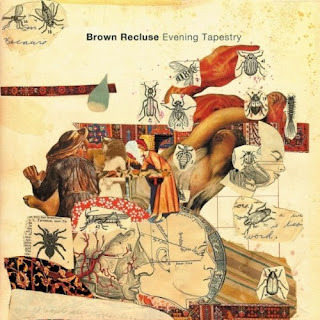 To start out here is a little background on the band from their record label Slumberland's website... "Brown Recluse formed in 2006 around the core of Timothy Meskers and Mark Saddlemire. Taking influence from the psych pop of The Zombies and Margo Guryan, the tropicalia of Os Mutantes, and 60s producers like Joe Meek and Phil Spector, the two recorded the bulk of their debut six-song Black Sunday EP. A brilliant blast of pop invention, Black Sunday easily rates as one of our favorite records of the last five years. Its blend of blinding songcraft, skilled arrangements and gorgeous playing is an absolute joy; it's rare to hear a record so assured from such a young band". Their debut album 'Evening Tapestry' was just released on Tuesday, March 15th, via Slumberland. I like to somewhat pick and choose what albums I listen too and review and this one I listened to a few times and thought it would be a great addition to FPT's and the type of reviews that I have to offer. Evening Tapestry really gives you that older vintage psychedelic feel to it. It is the type of record you could have on in the car with your parents and they wouldn't tell you to turn it off. Not that that would be a good thing or a bad thing it is just a record that everyone can truly enjoy. 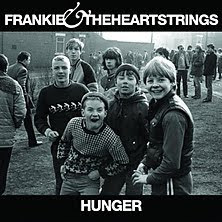 The record starts out with 'Hobble to the Tomb' as the opening track and delivers with some haunting horns with some low key vocals that are nice and short and direct. "Impressions of a City Morning" is the next tune and it has it's own taste bringing in a folky tamberine sound mixed with with some dreamy pop vocals. 'Statue Garden' is a classy yet fun type of song, offering some great vibes via a cool playing keyboard. Summer Showers is a simple song, and is followed by 'Wooden Fingers' which is one of my favourites on the album. It has a nice mix of background vocals, with some cool horns and a pretty sweet guitar solo near the end of the song. Beautiful Light is the middle track that is an instrumental one and acts as a seperater (or breather) for the rest of the album. 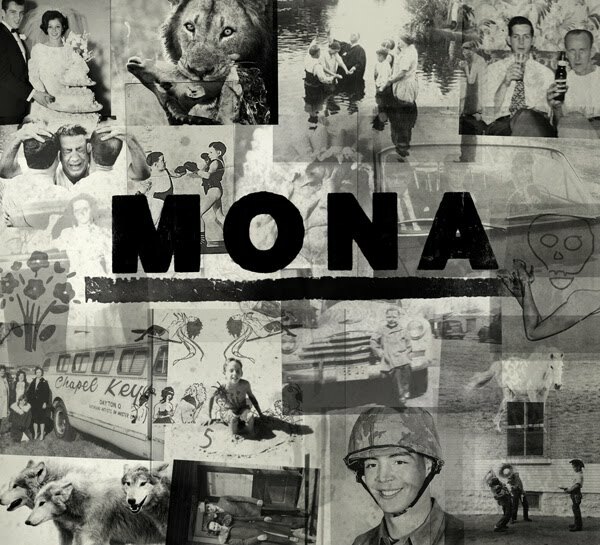 'Monday Moon' could possibly be the most complete song on Evening Tapestry, it has alot to offer with its strong vocals/guitars/drums/keyboard, and is a very well put together song. 'At Last' is a simple and honest song that leads you to the album highlight 'Golden Sun'. Golden Sun is my favourite song on this album and one of my favourite songs of the year so far. It opens with bells clinging softly and is followed by some soft horns and then the daunting vocals/lyrics hit you in the face. It is the perfect blend of music and Brown Recluse do a good job of including all sounds that work into each of their songs. The album ends with 'Paisly Tears' and 'March to Your Tomb'. Paisly Tears is more of a fader tune that leads you along to the next, and March to Your Tomb is a great ending to the album. It is the longest track on the album at 5:02. 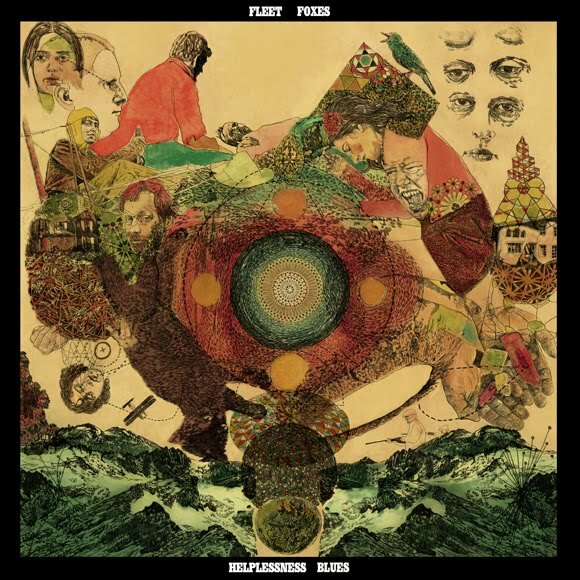 Ends with the same soothing vocals and psychedelic sound that was offered throughout the record. Evening Tapestry is a very direct and open album, nothing is left hidden it is all on the table for the listener to enjoy. It could very well be one of the hidden gems of 2011.